On January 29th the market began a crash that caused the Dow Jones Industrial Average to fall 2,500 points. The question is, whose gonna be right? My assessment of the market is that the crash was the first impulse wave of a new bear market. The present reaction, therefore, is a wave 2 corrective wave. Corrective waves can retrace up to 100% of the first wave down, but not exceed the high. This sometimes happens in slow rolling tops, but I do not believe this is one of those. 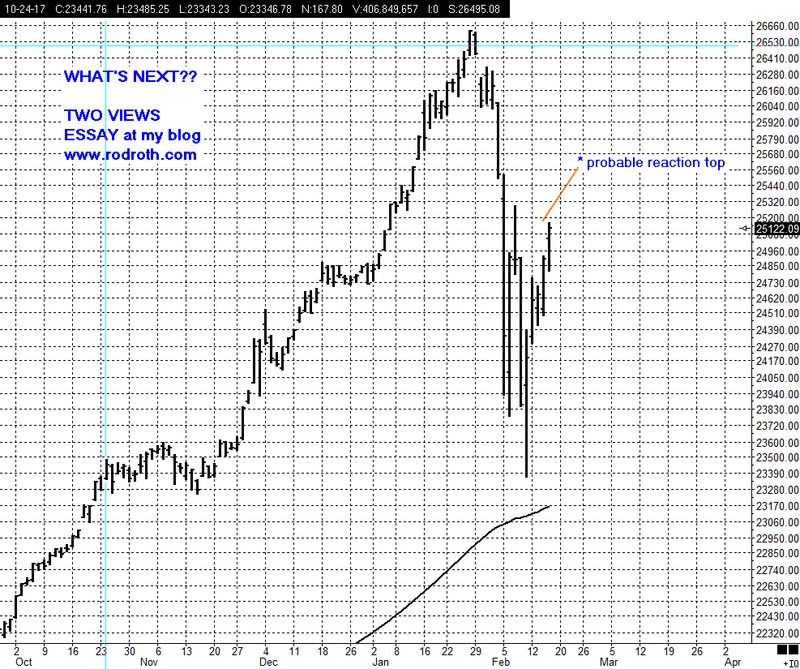 Should this retracement make a new high, it would mean there is more to go on the bull market. I regard this as a low probability. If my interpretation is right, the wave 2 retracement should stop around 25,600, give or take a hundred points. After that, wave three down would get underway and be violent again, crashing 5,000 points or more before the next pause. After that, much, much more decline would be coming. The source of this expectation is the Socionomic Theory of Finance, of which the Elliott Wave Principle is the foundational study. The decline will ultimately be a Grand Supercycle Bear Market. It will be an order of magnitude greater that the Bear market of 1929-1932, which was a Supercycle Bear Market. Individual investors have the heaviest portfolio allocation to stocks ever, and mutual funds the lowest allocation to cash. The sentiment of all participant sectors in the markets is at bullish extremes not seen in years. These lopsidedly bullish numbers are entirely consistent with major tops. My allocation is 100% cash. It should not take long to find out who’s got it right.